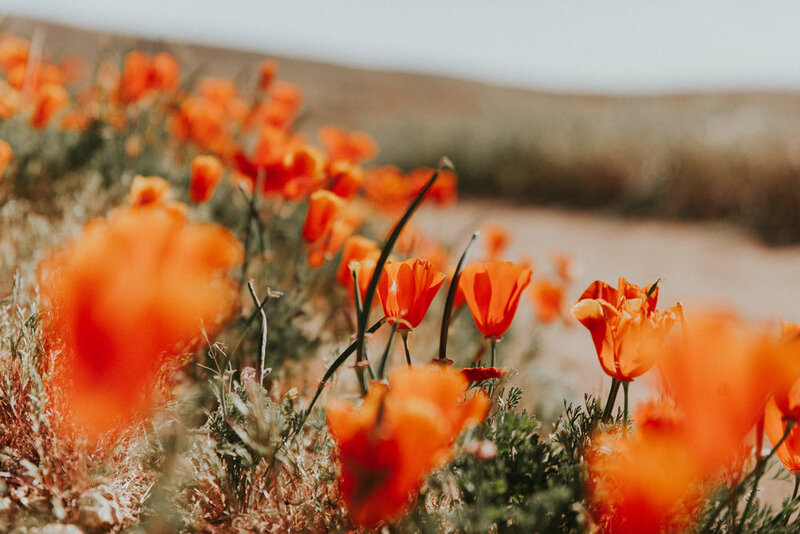 If you haven't already heard, California is experiencing a crazy growth of desert wildflowers this spring known as the "super bloom"! 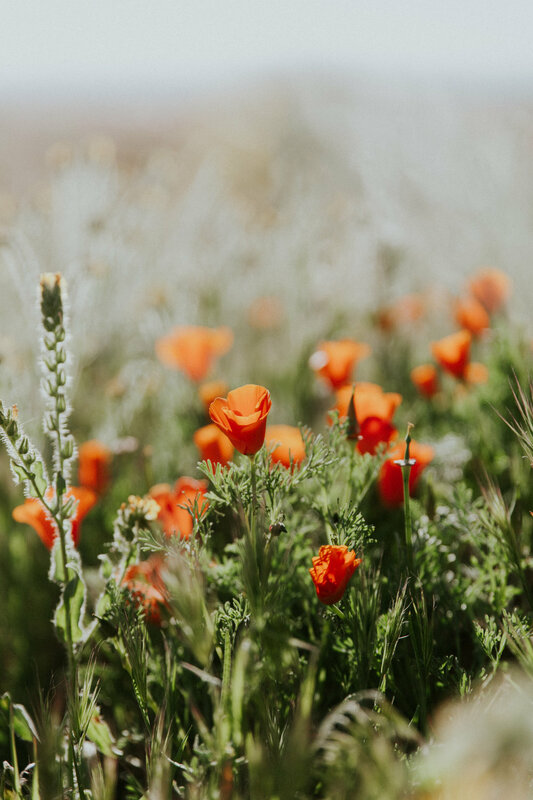 Thanks to the influx of rain and high winds, the wildflowers are growing like mad and it's the perfect time to frolic through rolling hills of the state flower. Where's the best place to catch the super bloom? 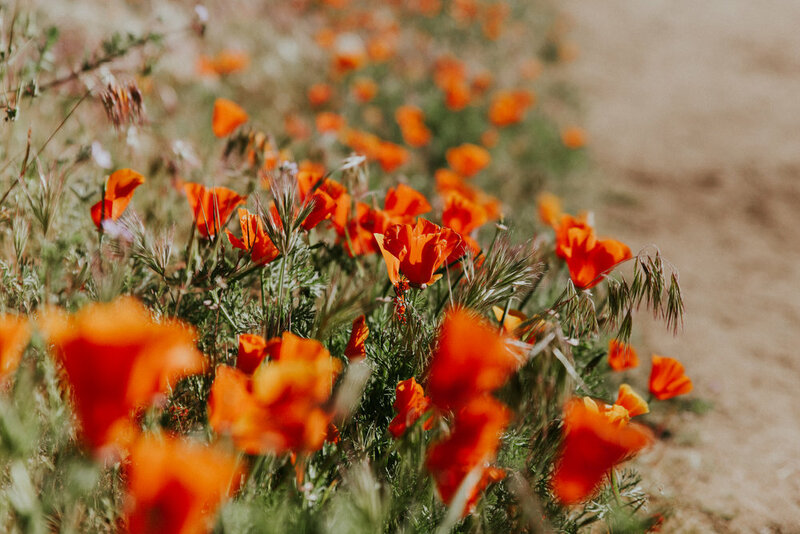 I'd recommend Antelope Valley Poppy Reserve or Lake Elsinore. For Antelope Valley, the best spot to see the poppies is on the Antelope Trail South Loop to the right of the parking lot (as of early April 2017). Click here for a trail map. You can also check the park website for updated info. For Lake Elsinore, you'll want to head to Walker Canyon. You can find further directions here or here. Get there early. That might mean waking up at 5am on a Sunday morning to ensure that you arrive around 7:30am. I know it sounds horrible, but trust me it's worth it. The crowds grow infinitely around 8:30am, so make sure you get there before then. Bring water. You'd think I'd know this one by now (especially after my post last week), but this proves it can happen to anyone. You'll probably be walking a lot further than you think and the desert gets dry (obvi), so just bring water. You'll be glad you did. Dress appropriately. If you want to get pics of you frolicking in the fields in a flowing sundress, by all means do it. But definitely ear a hat, sunscreen, and some walking shoes. Bring a bag if you want to change into sandals for your photo. It can get hot, cold, and/or windy so you'll want to be prepared. The poppies close when they're chilly. I know, it's kind of funny and adorable, but it's true! If you don't know much about the poppies, you might be surprised to see them all closed up first thing in the morning. They get cold when the desert evening temperatures drop, so they close up until the sun comes back out. It's better to arrive early and wait for them to open up than it is to arrive when they've already opened up (read: tons of traffic and hoards of people!). It was quite windy, as you can tell by my hair! Also, I just wanted to mention that we were extremely careful not to trample any poppies in this photo. We took this shot literally steps from the main road on a narrow path even though it doesn't seem like it (thanks to my long lens). Please help protect the poppies by not trampling them! Have you gone to see the super bloom? Where did you go?